The Ruffian boys have already proved they have the magic touch with makeup — their partnership with MAC to create a signature Ruffian Red lipstick created a stampede of sales not once, but twice. Well, Birchbox is hoping to tap into a little bit of that spellcasting, as they've paired up with the design duo to help them launch their very first foray into the world of nail lacquers. Set to launch in September exclusively on Birchbox, the actual shades have not yet been finalized. Why is that, you may ask? That's because Birchbox has decided to leave it to the fans to decide, so for the next two days they are hosting a voting session on Facebook and asking you guys to pick your three favorite choices. 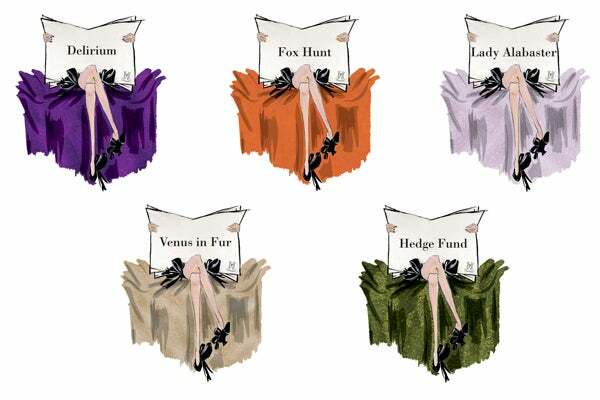 There are five total shades to choose from: Delirium, Venus in Fur, Fox Hunt, Hedge Fund, and Lady Alabaster. The three most popular shades will be put into production and sold as a trio in September, just in time for the spring '14 shows. Birchbox subscribers will also get samples of the three chosen hues in their September boxes. We're hoping Delirium, Venus in Fur, and Hedge Fund are the lucky polishes that get the green light. Check out the colors (depicted in the adorable illustrations above) and then tell us: Which three shades would you like to see in Ruffian's inaugural nail polish launch?